Wood studs and wiring are exposed in Blanca Esparza's home as a pest control worker searches for termites during reconstruction of the home Monday, July 9, 2018, in Weslaco. Esparza said she had about three feet of water in her home during the flooding event two weeks ago. 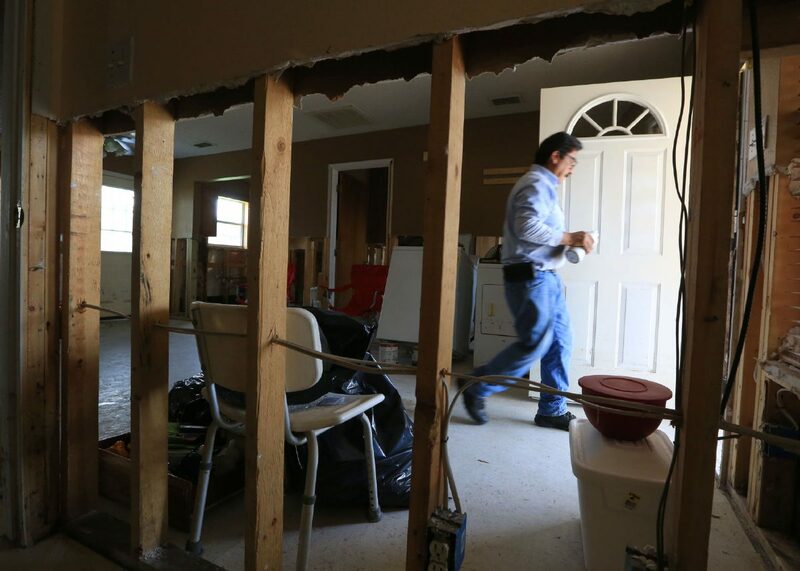 While residents continue removing moldy drywall and damaged furniture from within their homes, the Weslaco City Commission will hold a special meeting Tuesday to again discuss potential drainage upgrades — a month after a series of storms left portions of the county flooded. Commissioners met last week for a regularly scheduled meeting and discussed their cumulative approach in upgrading the city’s drainage infrastructure — an effort to alleviate some of the burden placed on residents whose homes flooded last month. Some of those homes also flooded in 2015. Last month, the city was among one of the hardest hit areas in the county by “incredible rainfall rates of up to five or more inches per hour,” according to the National Weather Service in Brownsville, which also noted the Mid-Valley sustained “peak rainfall,” potentially 13 inches in a “few hours,” during the unlikely rain event. Though the occurrence of such a storm is unlikely in any given year, as noted by the NWS in Brownsville, commissioners, along with the mayor have turned their focus to drainage by devising short- and long-term solutions. About 20 percent of the city’s homes sustained flooding, according to city officials, and hundreds of those residents have been critical of city leaders as evident in the heavily attended “flood forum” held by the city earlier this month. Commissioners will consider short-term and years long solutions at the special meeting Tuesday and may authorize a request for qualifications to hire a civil engineering firm to conduct a city-wide assessment, which would detail ways to upgrade the entire drainage system and the amount of funding necessary for long-term solutions. Those solutions, though, would likely require voters approving a bond since the city cannot foot the cost with monies available in its general fund, according to City Manager Mike Perez. The city produced about $26.7 million in revenue for the current budget year. An overhaul of the drainage system would cost an estimated $318 million — twelve times the amount in the general fund — according to a master drainage plan study conducted by Gonzalez De La Garza CFZ Group. “It would take us 12 years and putting every penny we have in it,” Perez said of the costly drainage plan conducted before he became city manager. The city would not be able to add street lights, improve roads, maintain parks and conduct usual business expected by city governments for more than a decade, if it were to complete the drainage plan at once. As pressure continues to mount from residents, commissioners look at ways to make strides in the decades old issue. They will hold a workshop at 5:30 p.m. Tuesday to discuss a handful of items including potential short-term solution to improve drainage, water pumps and regional detention facilities. A special meeting will be held at 6:30 p.m., following the workshop.